Jean-Jacques Rousseau initiated the modern genre of autobiography, vastly influenced the development of the Enlightenment through his political philosophy, and helped develop modern educational thought, although his book on the question outraged the French parliament so much that an arrest order was issued against him. 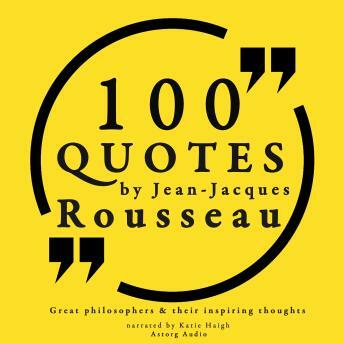 We have selected for you 100 of his most interesting quotes. They come from essential works like his Discourse on Inequality or the Social Contract, which shaped modern political and social thought; Julie or the New Heloise, which helped the development of romanticism in fiction; or the Confessions, one of the boldest and most honest autobiographical works ever written.